Power 4 Life – Adrenal, Mitochondria, Electromagnetic Pollution and Atlas Vertebra. Priority Interferences – Structure, Emotional Stress, Toxins, Allergies and Sensitivities, Electromagnetic Pollution, Nutritional Issues and Genetics. Core Beliefs – core beliefs are beliefs held by our subconscious mind that act as a blueprint for what it believes we need to survive. We want to make sure there are no subconscious road blocks to you being well. Zyto Basic Scan – a computer test to see which organs are stressed and which supplements are going to balance these organs. BIA (Bio–Impedance Analysis) – a computer test to determine the health of your cell membranes. 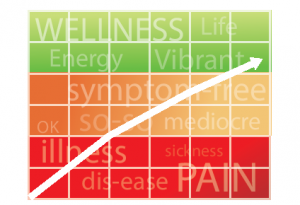 After determining your priority interferences, we use the Zyto computer to do an in-depth panel in that category to find what is stressing your body and what will balance those stressors and allow your body to stop reacting to them. After we have gathered all the results from the first 2 visits and intake forms, Dr. Randy will put together a written report and personalized plan of action which he will review with you in detail. Dr. Randy will also review any recent laboratory tests looking for optimal health ranges rather than just disease range, so we can catch and problems before they spiral out of control. In this phase we treat acute issues and change the direction of your life. Symptoms are usually much improved if not alleviated in 60 days. At the end of Phase 1, we will do a re-exam, at which point we will know, subjectively and objectively, how much change we have made in your cells and body. This is a less intense phase where your organs and tissues can continue to rebuild and stabilize so that we insure you don’t go backwards. This is important to make sure these changes become your lifestyle. In this phase we need to look at diet and exercise, as well as other lifestyle factors to make this becomes a long term success story for you and your optimal health. As we continue with care, it will let your body rebuild and regenerate your organs and tissues and reverse your biological clock as you continue on to Optimal Health.